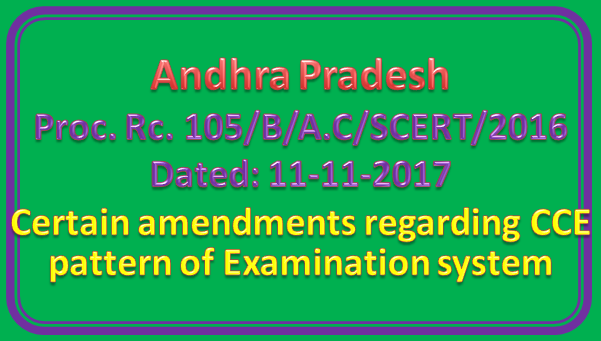 Sub: SCERT, AP, Amaravati – School Education Department – Continuous Comprehensive Evaluation – Implementation of Examination reforms- Certain guidelines – Orders – Issued - Reg. 1. G.O. Ms. No.17 School Education (Prog.II) Dept., dt.14.05.2014. 2. G.O. Ms. No.29 School Education (Prog.II) Dept., dt.23.09.2014. 3. G.O. Ms. No.82 School Education (Prog.II) Dept., dt.29.10.2015. 4. G.O. Ms. No.41 School Education (Prog.II) Dept., dt.07.06.2016. 5. G.O. Ms. No.80 School Education (Prog.II) Dept., dt.25.10.2017. All the District Educational Officers in the State are informed that as per the reference-5 citied above Government of Andhra Pradesh issued orders on certain amendments regarding CCE pattern of examination system. In this connection all the District Educational Officers are informed that instead of three Summative Assessments only two Assessments will be conducted from this academic year. SA-1 examination which was conducted in the month of September was cancelled due to leakage of Question papers. As per the Reference -5 cited above Summative Assessment –I is going to conduct in the month of December in place of Summative Assessment-II as mentioned in Academic calendar. SA-I examination will be conducted for class VIII and IX in OMR enabled MCQ type and Class VI,VII and X in regular type. SA-I examination is scheduled from 13-11-2017 to 20-11-2017. In this connection All the DEos are informed to conduct HMs meeting to provide awareness on new pattern of examinations and also instruct them to practice their students about OMR bubbling in their schools. Further all the District Educational Officers are informed to take necessary action to constitute Three Man Mandal Level Verification Committee and also informed to communicate recent changes in the Examination pattern and guide lines which is annexed to all schools under all managements in their respective districts. Government of Andhra Pradesh issued Amendments orders to G.O.Ms.No 82,29 and 41 relating to CCE. In this connection SCERT issuing the following guidelines regarding syllabus, examination and grading procedures. • There are Four Formative Assessments and Two Summative Assessments in the Academic Year. • There are Two Summative Assessments ( SA-I, SA-II )in a Academic Year. • SA- II for class – X is the Pre Final examination, this will be conducted in the month of March. • SA- II for class – VI to IX will be conducted in the month of April. • SA- I for class – VIII and IX is OMR enabled Objective type assessment from this academic year. • SA- I for class – VI to IX is OMR enabled Objective type assessment from the academic year 2018-19 .
all Subjects as mentioned in the text books. • Summative Assessment will be conducted for 80 marks only. • Grade will be given on 8 point scale. • Mandal Level Verification Committee may visit all High schools under all managements in the mandal twice in a year. • Mandal Level Verification Committee should verify answer papers, Project reports and other formative assessment evidences and cross check with school records with online entries. • Mandal Level Verification Committee first visit is after SA-I, second visit will be after 4th formative assessment. • Internal marks verified by Mandal Level Verification Committee shall be forwarded through Dy.E.O to DGE. • Mandal Level Verification Committee may also observe examination procedures of remaining classes in the scholls.